We’re proud to be a family owned & run business that started life well over 40 years ago by it’s founder Bob Urie. 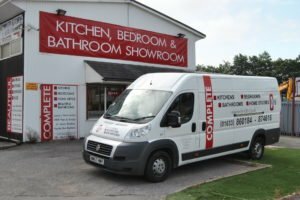 We have now grown to be one of Wales’ premier showrooms with one of the largest displays of fitted kitchens, bedrooms, home office & bathrooms in South Wales. We have always been renowned for our quality, service and attention to every detail. As a small company we’re able to spend time with you to concentrate on every intricate detail regarding an installation that you may be interested in, Whether it’s a new fitted kitchen, fitted bedroom, home office furniture or fully fitted bathroom. We have established brands such as Beautiful Bathrooms within our company & have our own fully qualified installers. We’ve also set up our own YouTube channel with various videos for your information, Facebook pages where we often go live to show the latest installation, Houzz page, Pinterest page, Twitter account so you can contact us anytime, be sure to drop by these sometime and let us know what you think of them. Below is a short video advert that we created to support Cheeky Monkeys, a local soft play centre.